Bold electronica from Elite Barbarian for fans of Ben Frost and Pan Sonic. It's the first release from the design-orientated Front & Follow label, coming housed in an impressive arrangement of embossed card, woven badge and elastic band, we'll leave the specifics for you to discover. 'It's Only When You Get To The End That It All Makes Sense' is alternately brash and tender. 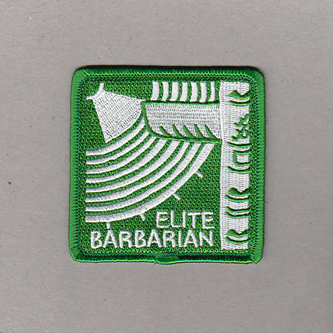 Like our comparisons above suggest, Elite Barbarian has a great grasp of light and dark or soft and heavy tones and textures, diverting his energies between rhythm driven electronica that could have slotted into the older Skam aesthetic, to abstract piano workouts and electro-acoustic experimentation rooted with a melodic sensibility that prevents this from veering too far into academic territory.